This item was introduced in E-Prime 2.0 (2.0.10.182). E-Prime includes the "No Repeat After" option that applies when sampling stimuli from a List Object. When sampling rows from a List object using the “Random” order, exemplars from the List Object are selected at random, without replacement, until no exemplars remain. Once all of the exemplars have been selected, they are returned to the pool of available exemplars and random selection begins again. 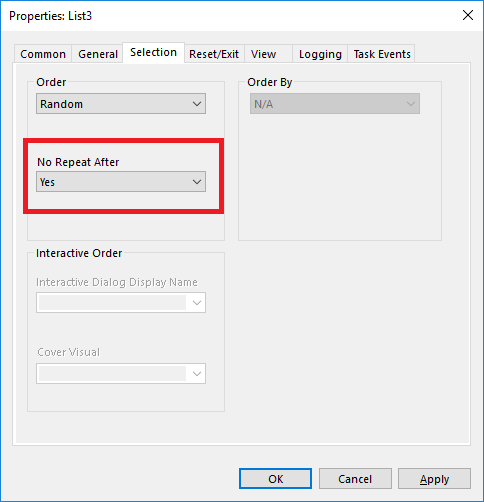 However, if the new option to not allow repeats after resetting the exemplars is selected, then the sequence shown above would never occur. E-Prime checks the first exemplar that is selected after resetting, and ensures that it does not match the exemplar that was the last item selected from the prior pool of exemplars. The “No Repeat After” option is set to “N/A’ for all other ordering methods. 1/30/2012 8:49 This options is not available in the Version of E-prime that I am using. I am using version 2.0 as this document is written for but the "no repeat..." option is not present in the display??? 2/17/2012 13:00 Great feature, thanks for adding this! Is the non-repeat algorithm deterministic, or nondeterministic? E.g., when EP finds that the first examplar after resetting matches the last item used, it could reshuffle the List order until the first exemplar happens to differ. This would be a nondeterministic method. Alternatively, when EP finds that the first examplar after resetting matches the last item used, it could rotate the List order until it starts with a different item, or search down the List order and swap the repeated item with a different one. These would be deterministic methods. Thanks. 2/29/2012 15:48 The process is deterministic. If the first item is a repeat the next is used but the first is placed back in to be included in the reshuffle. 2/11/2013 17:11 Is there any way to extend this such that Cycle 2 would not begin with any of the last three stimuli that made up Cycle 1? 2/21/2013 10:00 Custom ordering and conditions outside of this feature can be accomplished by adjusting the order of the List ahead of time and using Sequential ordering. Further custom ordering can be accomplished by using E-Basic script to populate the List object by making a sequential order OR using the ExplicitOrder sampling type.